So we had an extremely eventful September; in the first half, Nifty went on to make new highs and in the expiry week gave up all the gains of the last 6 weeks or so. 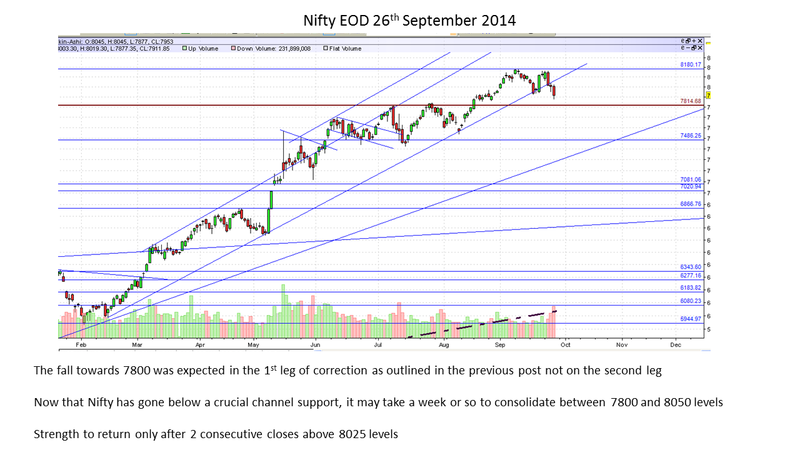 I was expecting Nifty to stage a pullback from 7925-7950 levels which did happen once only to fall back again. 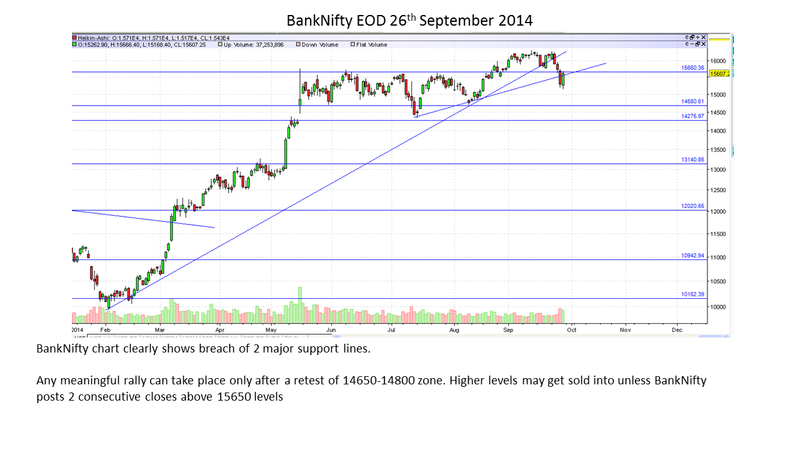 The most critical support is in the 7800-7850 band from where a strong bounce is expected. 2 consecutive closes below 7800 or 1 close below 7800 on a weekly basis sets the stage for a deeper correction to 7400-7500 levels. 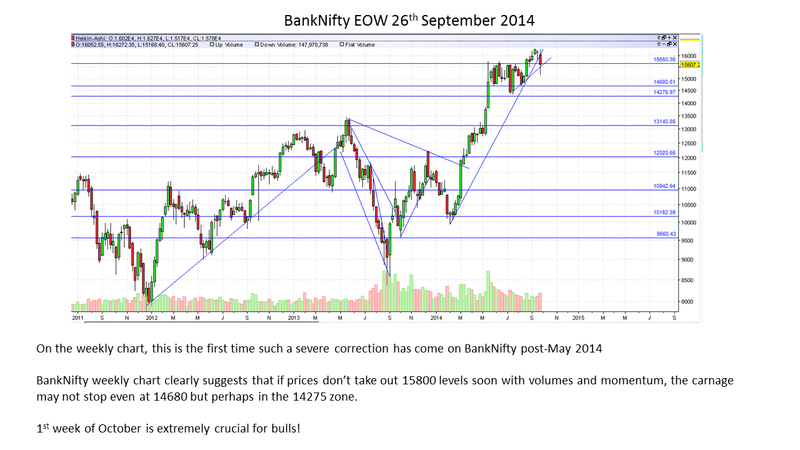 This seems unlikely as of now in October series considering the run up [anticipated] for the Diwali rally. As mentioned in my previous post, a weekly close below 7800 will imply that the bull party for 2014 is over. The eventual fall from the current euphoric levels will lead to 6900 levels on Nifty, most likely in the second quarter of 2015. However, I doubt whether the deep correction will set in before the Diwali rally [which mutual fund houses need to be able to distribute stocks into and get the retail suckers in for infusing funds!] 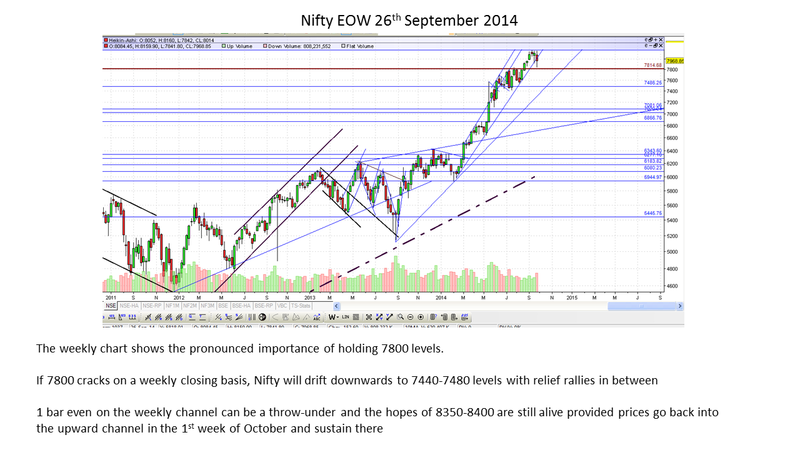 As long as 7800-7850 levels hold, I personally will still look for opportunities to go long. This has been a darling sector for the last 18 months, thanks to the equities rally overall and a weak rupee. This is the weekly chart of CNXIT. It has been in a secular bull run from the lows of 2008 from an investor's perspective. It is currently hovering around the 11100 mark and may test 12k levels soon from where a significant correction is expected. The technical supports for this are in the 7k to 8k zone which will come at some point of time within the next 12 months or so. When it is oscillating in the 7k to 8k mark, is the time to lap up technology shares. 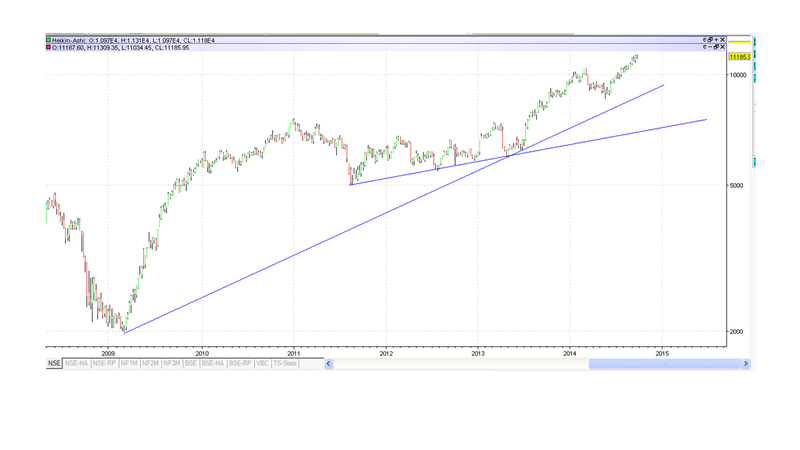 So, the new bases for TCS will likely be the 1400-1800 band, INFY in the 2400-2800 band, Wipro in the 350-400 band. Does that imply these stocks won't correct below these levels. For all you know, they may but from a longer term investment perspective [3-5 years], corrections below these support levels will just be aberrational blips. This is the CNX Pharma chart that has again been in a secular bull run for a prolonged period. As can be seen in the graph, the run up of 2013-2014 has been much higher than usual and will correct sooner than later. The base for CNX Pharma is around the 8000-8500 mark now where one should accumulate. This implies a 20%-30% correction in names like Lupin, Sun Pharma, Cipla etc from the peaks whenever they come. 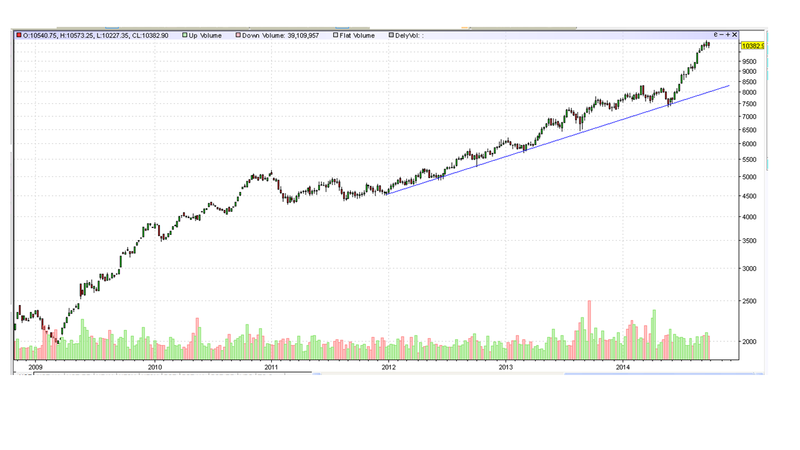 Any fall below 8k levels in CNX Pharma will just be a blip. One can see a similar pattern in the FMCG space as well. Names like HUL, Nestle, Dabur, Britannia have all rallied significantly. They are all due for a 30% correction from current levels which will be opportunities to buy. One hears calls for 50%-60% correction due to the fact that most have doubled or tripled but that seems very unlikely. These are products that have definite consumption in a lot of categories and an exponentially growing market due to high population. All though perpetual growth of 5%-10% will be challenging due to the base effect and margin pressures will be there due to high marketing expenses, this is a segment one can comfortably bet on in the long run. If timing the buy is challenging, just go for an SIP on the consumption theme as it tends to give a CAGR of 15% to 18% in a 5 year period. The automotive and related categories' space is the one which is in most over-heated territory. The most common themes are related to the fact that more and more people are buying cars and the fact that commodity prices are falling that is helping the bottom-lines of companies. What is missing in most analyses is that only 1 out of 4 car models launched actually becomes a hit. With more and more car variants and brands coming up, it is very unlikely for any particular variant to sell more than 100,000 cars per year. Gross margins at manufacturing level are around 6%. At some point of time, the discounts due to lower input costs will have to be passed on to the customers and there will be a lot of margin pressure due to marketing expenses and competing to generate business volumes. Most vulnerable to a severe fall are the tyre companies like CEAT, Apollo, MRF, JK Tyres etc. I have no clue as to how much more they will rally but this segment is sure to crash by at least 50%. As far as counters like Tata Motors, M&M, Maruti are concerned, they are also due for a 20% to 30% correction from current levels. Of course those falls are buying opportunities. The medium term is bearish and Indian equities are very highly priced. Valuations are excessive and a correction is likely. The fair value of Nifty IMHO is around 6600 with all the positives of the new government, low price of oil, government divestment in PSUs etc etc. However, as we all know, stocks never trade at fair value. They trade at excessively high or low levels. This upleg that I am talking about is in its terminal stage. Once the Diwali rally and distribution is complete, Nifty is expected to slowly drift down to 6900 with stops at 7600, 7400 and 7200. The long run is still bullish for India and 5950-6280 zone is the new base for Nifty just as 4800-5200 was in 2011-2012. Corrections beyond this new base will just be temporary aberrations. For instance in the severe correction post-Lehman Brothers, the logical stop was around 3800-3900 for Nifty. It didn't stop over there and went well below the 3k mark. For somebody looking at the chart on hindsight [moi included as I entered the market in 2011] the bars below 4k levels are mere blips and the numbers statistical aberrations. Same is the case for the fall below 4800 in December 2011 which was troned out within 2 weeks. The investments made in such periods of mass hysteria and bloodbath tend to be the most rewarding ones in the long run! Gold and Silver are at good accumulation levels for the longer term. Crude Oil (WTI) should find an intermediate bottom in the 90 dollars per barrel mark. Wishing all of you a profitable October and greetings for the festivities.